June 1938 and Germany seems poised to invade Czechoslovakia, the French and British trying to find a path of appeasement. In Berlin, Colonel Oster tries to persuade his boss, Admiral Canaris, that a military coup is the only way to deal with Hitler and the Nazis, but the head of Military Intelligence prevaricates, despite the rumour circulating about war and eugenics programmes. In New York, veteran of the trenches, Fintan Dunne, has left the police to ply his trade as a gumshoe. He accepts a job to investigate the supposed framing of a Cuban refugee for murder; a case that nobody seems happy he’s pursuing. The case proves more complex and dangerous than he anticipates, tainted by police corruption, politics, and the long shadow of events in Germany. But Dunne isn’t a quitter, despite the risks and consequences. The strength of The Hour of the Cat is its plot, characters, and historical contextualisation and detail. The story is an expansive, complex but intricately plotted tale that blends a traditional style private investigator tale with national and international politics. There are numerous interlinked subplots that mix fictional and real-life characters and are contextualised within the historical record of the time, such as the eugenics movement on both sides of the Atlantic, the expressions of Nazism in the US, the neutrality position of many in the US, developments within Germany and plots inside its military, and even weather events. Along with its elaborate plot are a large cast of characters, each of which is well drawn and accompanied by a back story. The result is a compelling and fascinating tale. Where the story is let down a little is in the telling. The slow pacing, detailed contextualisation, and understated prose produces a rather flat narrative, with a little too much of the telling not moving the story forward, and the complexity of the story might have benefitted from losing one or two subplots. 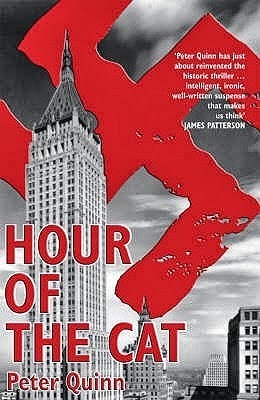 Nevertheless, The Hour of the Cat is a clever tale that provides an interesting insight into the US life and politics just prior to the Second World War. Rob, I think I commented before that my husband read this and liked it. I am looking forward to reading it sometime in 2014. This is a good and very useful review. Thanks.